So your dam has finished having her puppies... Are you sure? It can be difficult for an owner to be certain, so it can be wise to take the dam and pups to the vet within about six hours. The vet will give checkups to ensure the dam hasn’t retained pups or placentas, and to see that the pups are all nursing and healthy. The vet can also check for cleft palates and inform you of options available (see article on cleft palates—these pups are worth saving), but if you are pretty sure and experienced enough to know the pups are all out, it is best to leave the dam at home, as every time you take her out, and to the vet, you risk bringing home a virus. Many vets will do a house call, and the extra $20 or so is well worth it. Normally after whelping she will stop shivering and panting, clean her pups and herself and settle down to feed her pups…. If all seems normal, I just call my vet and let him know what has happened. Take the dam out to relieve herself, and give her some fluids. Chicken broth or Mamalac are good. I give chicken broth, chicken and rice for first meal. Freshen her up with a sponge bath and put nice clean bedding down for her and her new family. (If you are using a heating pad it is extremely important that it is enclosed securely in padding so a pup cannot get caught down there under the bedding…. Some new moms try to bury their pups). I actually will NOT put a heating pad IN my whelping box. 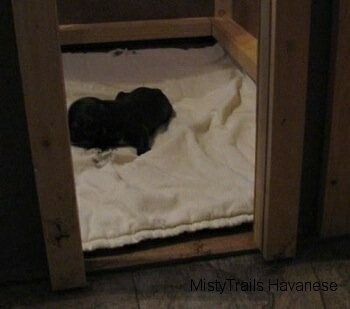 My whelping box has a wooden bottom, and the heating pad goes UNDER the box, under the plywood floor; this makes a nice radiant heated whelping box floor. Vaginal discharge should be red to red/brown and even maybe a bit green for the first day. If it is black call your vet. Discharge lasts for about a week, slowly turning clearer. If it continues, or develops a foul odor, call the vet. Some dams spot blood for a week or two. Make sure each puppy gets his/her share of colostrums, which are loaded with antibodies for protection from disease. Full supervision is recommended until she has accepted the fact that she is a loving mom. For some breeds, like the giant and clumsy breeds, pups cannot go with the dams for a week or two, but must go in an incubator and be put with the dam every two to four hours. Check your breed. If they are known to lie on pups and suffocate pups, you may need to find a mentor in the breed for some sage/educated advice. I personally sleep next to my dam and puppies for a few nights, to ensure she does not roll on a puppy, or a puppy does not get out of the bunch and get chilled, etc….They are VERY susceptible to cold. The whelping box should be at 85°F for the first week and 80°-82°F the second. Make sure there are NO drafts. Make sure puppies CANNOT get out or roll out. I leave a baby monitor on, and if a puppy is crying more than usual, I go to see why. Sometimes a puppy will latch on so tightly to the dam that he gets dragged out of the box, sometimes he is lost in the blankets. Your whelping box should have guardrails to help protect the puppies that crawl behind the dam from suffocation and squishing. In the first week, puppies eat constantly; they spend 10% of time eating, and 90% of time sleeping. They need and get constant care from the dam; they cannot even relieve themselves without her stimulation…. She will keep the whelping box very clean for the first couple weeks (up to three weeks). 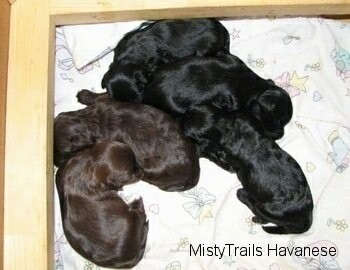 It is wise to weigh the pups twice daily for the first week, and once a day after that. They can lose 10% of their body weight the first day, but you should see a steady increase after that. My goal is for pups to start gaining right away, and not have that drop. Schedule vet visit at three days for dew claws and any other tail/ear work required for your breed. Trim the puppies’ nails weekly. Feed the dam three times daily (three times normal amount of food or more). Check her milk glands twice daily for mastitis (swollen, hard teats). If you notice an excess of milk, she will become uncomfortable and restless. This can be relieved by squeezing the teat; draining some milk will reduce the pressure. If you fail to relieve pressure, call your vet. Milk fever is serious, and talked about on the whelping page, as it can come before puppies, but is normally more common when milk is being produced. Some dams need extra calcium. Eyes should open on day 8 to 13 (never attempt to open the eyes). Ears should open on day 13 to 20. 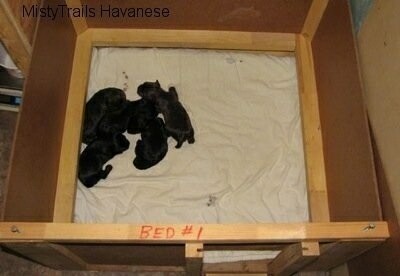 At 2.5 weeks, open the whelping box and add an area two times the size and cover with newspaper…. Change the bedding in the box several times per day, but do not change the paper often (keep it smelling like a toilet and keep the bed smelling like a fresh bed…) The puppies will be paper trained by 3 weeks…. By 4 weeks, you will need to expand their home again to include a play area. At three weeks, their teeth are developing. Some large breeds are ready to try soft food and toys. They can lap water and Mamalac. Slowly add soaked puppy kibble. For smaller breeds of dogs, they do not need food till 4 or 5 weeks old. Check your breed. Also, all litters are different. A litter of eight puppies will need food sooner than a litter of three puppies, even if just to give the dam a break. If the Dam is feeding the pups, there is no crying and they are content, then do not rush weaning.